Shot on a sunny mid-afternoon but dark clouds are gathering which brought snow in Toronto later that night. 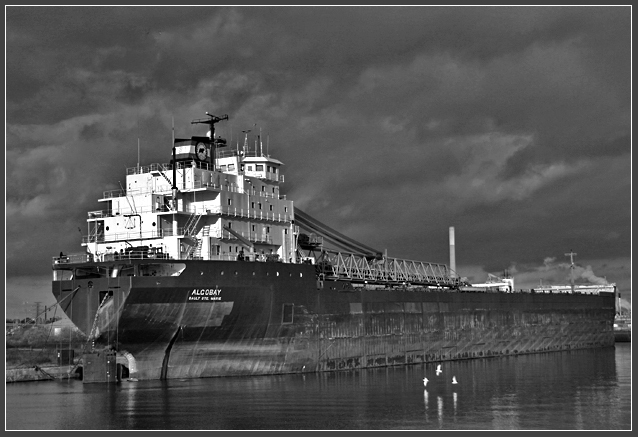 This is a ship that moves cement from the factory in Toronto to a place in Sault Ste. Marie, Ontario. It's been docked at the Ports of Toronto for months now apparently for repairs. This ship because of its size is very imposing but it looks lonely and neglected. I converted to black and white in order to show some degree of loneliness. The dark clouds probably helped create that atmosphere. This is really a beautiful image,and I'm speaking as a long-time zone system photographer. Your use of the tonal range here is fantastic. I do wish the ship didn't appear to be listing slightly to port. 1 degree clockwise rotation would fix it, I think. Assuming you have room enough on the original: if you rotated this version and cropped the vees out the bow would end up right on the edge of the print. This is simply a beautiful and breathtaking image. Very nice work. Excellent comp... the storm clouds really add drama to this shot. Congrats on your first ribbon! Excellent contrast really makes the ship pop out of the shot.The birds in the shot really helps to give you the sheer size of the ship. The sky is also pretty incredible. The frame choice is perfect and helps to compliment the composition. Congratulations on the ribbon. Message edited by author 2003-12-24 18:24:29. Hey, I just noticed this is your picture! CONGRATULATIONS on your first ribbon!!!! Good work! Very moody shot, sort of ominous. I really like the B&W here. Congrats on the ribbon! Very big sky in this shot- what clarity. Awesome composition. Well deserved. I have to admit I saw the thumbnail and said"what the hell is that" - but that is just proof that the big shot is what counts! Thank you all wonderful people for voting and leaving comments. I'm excited about this win, had fun doing and I myself is really happy with the way the photo turned out. All your comments/suggestions are all helpful and will keep them all in mind when working on a new project. Thanks again one and all. and happy holidays.! Congratulations to all other big winners and their great work. They all deserve a pat on the back or two. I'm looking forward to seeing more high quality photos. Congratulations, one of my 10's! Also from me congrats to the blue ribbon. Well deserved! Congrats on your first ribbon and first place. An excellent shot - unfortunately I did'nt see this one when I was voting. Great work and congrats on the blue!!! Congrats on your first ribbon. This was definately one of my favorites! Very nice use of B/W here. You have some awesome tones that I don't think would have worked in color. Great capture of the stormy looking clouds. Beatiful shot! Nice clear shot. Good contrast. The seagulls give it some perspective. Really nice shot. Great work. .:9:. I like this - I think it is too bad the sky was so cloudy, it might look a little better with a clear sky. The B&W is great. I really like the contrast between the white tower of the barge and the dark cloudy sky. I like allmost all boat images in this challenge, but this I like most: great composition (like the 3 birds), well cropped and B&W is well chosen. The sky is perfect too. Good luck to you. Very solid photo. One of my favorites for this challenge. That's a nice shot -- like the sky! Voted 10 on this one ! too much nice things to say. I think the angle U took this shot was lovely, well done! However I also think that the image is a tad on the glommy side. Will love it more if it looks more on the brighter side. Beautiful, stunning shot. The birds are just key to the over all feeling of length and depth. Nice tones. Good shooting. Wow. I like this one a lot. Should finish with a ribbon. I can't really find fault with anything in this shot. Good work. Very nice. Like the sky. and the contrast. Oooh...a dark and forboding image. Interesting! The three birds really add a lot to this photo. Proudly hosted by Sargasso Networks. Current Server Time: 04/21/2019 01:02:14 PM EDT.